Jo-Ann was a child prodigy who went to college at age 14. She graduated and landed a coveted job at Citigroup. Soon she was flying around the world leading meetings. Then she jumped to a management role at a financial printer. She was middle class, maybe even on her way to the upper middle class ... until the tech bubble burst. And September 11th hit. The U.S. fell into a recession and companies cut back. In 2002, Jo-Ann was forced to train the Indian workers that would replace her. After she was laid off, she struggled to find a good paying job. She melted down her savings and 401k. She got into the trap of working "dead-end crap jobs with crap wages," including a stint at Walmart. Her life went from American Dream to Bust. Today she's in her mid-40s and makes $11 an hour processing payments at a financial firm despite being college educated. Her story is exactly what so many Americans fear -- that they are one step away from financial ruin. It's why they are drawn to Donald Trump and Bernie Sanders in the 2016 election. "The anger is boiling over. Enough of the American people have got it through their heads that the American Dream is dead for us," says Jo-Ann, who lives in Pennsylvania. She requested that her last name be withheld for this article so it wouldn't impact her ongoing search for a better job. The economy is the No. 1 issue on voters' minds even though America is growing, unemployment is incredibly low (4.9%) and gas is cheap. "I thank God I don't have a kid. I don't know what I would tell them," she says. Her advice to young people is to skip college and learn a trade like plumbing that probably won't be shipped overseas. She supports Sanders. She agrees with him (and Trump) that trade deals like NAFTA are part of the problem. Americans are on edge. Many CNN readers responded to a recent survey about their economic worries. Over and over, people said they were fearful of losing a job, of a health problem that would drain their savings, of wages that aren't growing and of diminished prospects for their children. Billionaire investor Warren Buffett argues people are way too pessimistic about the economy. He says babies born in America today are "the luckiest crop in history." But Americans fear life could derail quickly, much as it did for many during the Great Recession. "The job market is tough. People are scared. 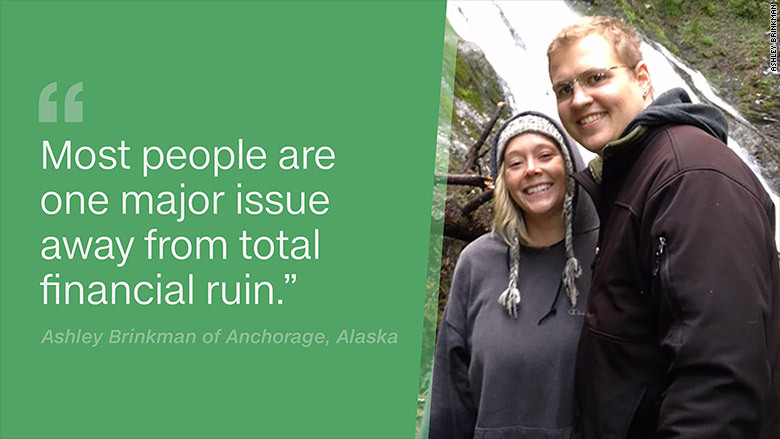 They aren't leaving their jobs," says Ashley Brinkman, 28, of Anchorage, Alaska. She and her husband have jobs they enjoy, but they look around and see mass layoffs in Alaska's energy sector and cuts to education. "We are living the middle class dream. We vacation once a year and own a camper," says Brinkman, who recently received an $11,000 raise as she moved up the ranks from being a bank teller to a management job. But life hinges on staying employed. Brinkman grew up in a small South Dakota town. She says people there describe this presidential race as akin to "picking the cleanest turd out of the bunch." 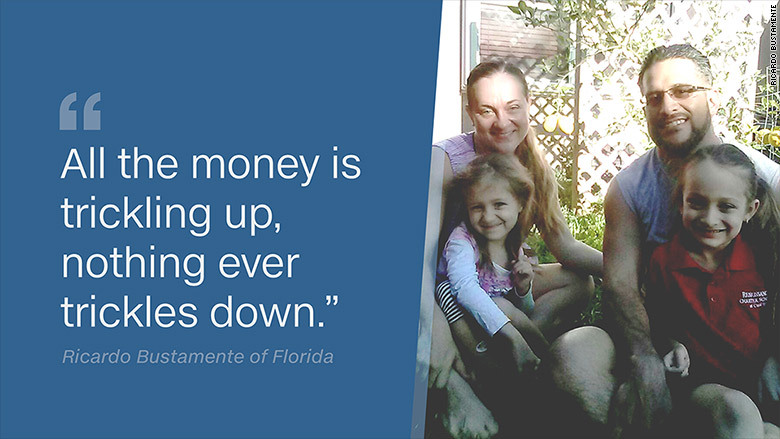 Share your story with CNN: Are YOU worried about the economy? People are especially concerned about the future for their children. In a CNNMoney/E*Trade survey this year, 56% of people said they think their kids will be worse off financially than they are. Ricardo Bustamente has worked for years as a technician at Verizon. He's often told "do more with less." He's learned that means more work for him as others get laid off, but no extra pay. "My biggest fear is that this country is going to become a nation of have and have nots. People at my level are slowing dying out," says Bustamente, who is about to turn 43 and has three kids. He hasn't gotten a raise in almost 8 years, but his expenses keep going up. He drives a 10-year old car and his wife diligently clips coupons and buys items on sale. "I'm literally making less money every year," he says. If he loses his job, his family might lose their house. Bustamente likes a lot of what Sanders is saying, especially on making college and health care more affordable, but he doesn't think Congress would ever enact Sanders' policies. 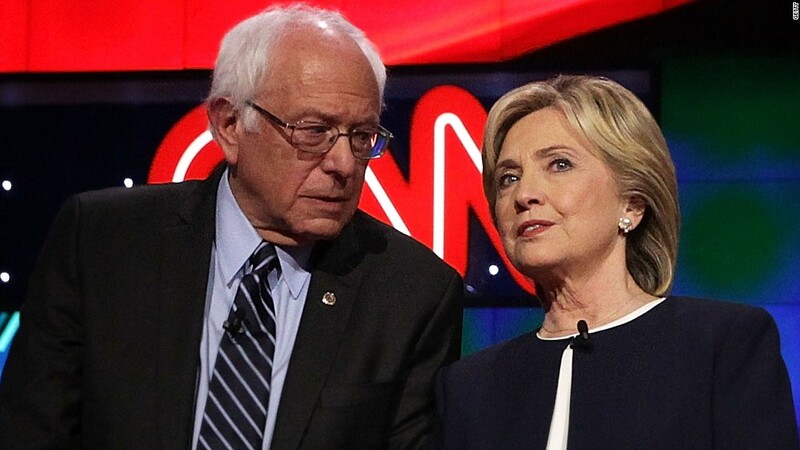 Still, he is glad Sanders entered the race and has influenced Hillary Clinton. "Slowly but surely I see myself and others around me eroding. We're definitely not moving up. We're moving backward," he says.